It gives Ari his voice. And it allows us to bear witness to his fight. He can’t say how much he misses his room at home. How he’d so rather be doing something else besides whiling away the time until the next echo. How much it hurts when they have to stick him again and again to draw labs. But being here hasn’t been easy. It’s not about to get easier. Neither is the story telling. Figuring out just the right tone for these posts has been an exercise in self-doubt. When we first heard the news of the congenital heart defect, the experimental fetal intervention options, and the uncertain future, we knew people who love us would worry. Nothing we could do about that, but, with a bit of levity, we could give everyone the sense that we were hanging in there, and perhaps decrease the worry level by a degree or two. We didn’t, however, want to sound cavalier, or give the sense that the gravity of the situation was somehow lost on us. We also didn’t want to leave out what was going on medically, but a series of lectures on heart anatomy and physiology was neither within my reach to deliver, nor would they serve much of a purpose. We’ve tried to find a balance, though it continues to feel elusive. It’s funny. I’ve written a couple of books, but most days I don’t feel like a ‘real’ writer. Real writers are forcefully expressive. They treat the trickiest of subjects with elegance and grace. Real writers make it seem so natural. In On Writing Well, Bill Zinsser makes the case that writing is more a craft than art. That toil and care are stronger factors in success with the written word than talent and inspiration. As hard as I might go at writing this update, I fear it’s beyond my abilities to make the reading any easier. I could work at this for years. It would never feel natural. 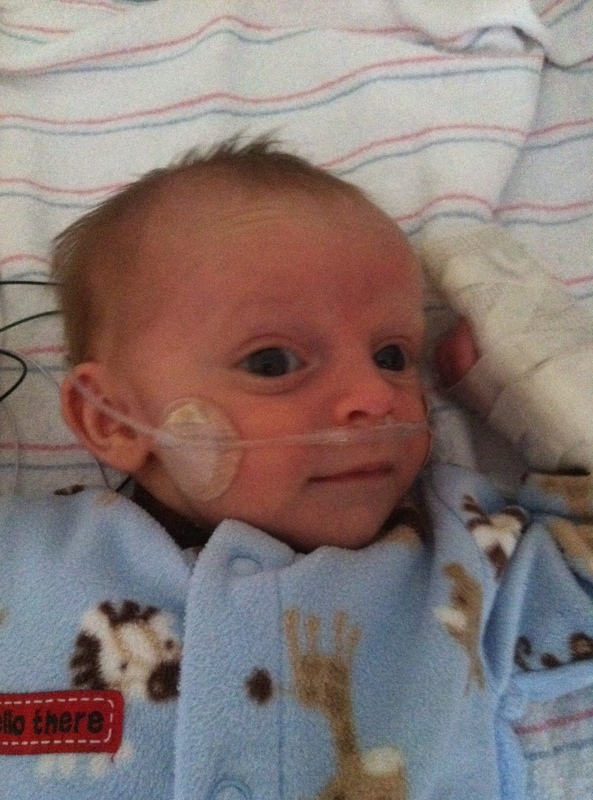 Heart catheters – Ari’s now had 4 – are balloon procedures. The idea is to blow a balloon up to widen the valve or unstick the leaflets that might not be functioning properly at the top. Ari came through last week’s cath without complications, but it did not have the intended positive effect. We were told (not like we had to be) that, in this journey, steps back would accompany steps forward. Simon says…step back. You’ve met Ari’s aortic valve and his left ventricle. Today we introduce two new main characters: his right ventricle and his lungs. Right ventricles send blood to the lungs to pick up oxygen. The pressure in his right ventricle is “systemic” at the moment, meaning it’s riding up and down with his blood pressure. The right ventricle pressure should be half of this or less. If my understanding is correct, the high pressure is a function of his lungs, like a super tight muscle, not relaxing like they should. The label for all of this is pulmonary hypertension, the threat of which cannot be understated. No joke warning: do not look up pulmonary hypertension if you are not prepared to read something unsettling. The question now is this: Is the pulmonary hypertension a permanent condition, or is it caused by the persisting severe aortic stenosis and the scar tissue in his left ventricle? Our cardiologists and surgeons believe that it is not a permanent condition, but that we need to help his heart out more, and we have reached the limit of what we can do in the cath lab to effect this. Since we cannot stand pat with pulmonary hypertension, the next order of business is open heart surgery with the intent to repair the aortic valve. Note that by “repair” we’re talking more duct tape to keep it holding together for a while versus remodeling and restoration to the blueprint nature intended. With pulmonary hypertension now in the picture, the “trump card” that our cardiologist has had in his pocket since day one, the Ross Procedure, may have temporarily lost its trumping abilities. With the Ross, the doctors would take out Ari’s aortic valve and throw it in the circular file, remove the pulmonary valve and put it where the aortic valve is now, and put a homograph where the pulmonary valve used to be. But the homograph can’t sustain the pressure of pulmonary hypertension, so we are now left with a likely less-than-ideal attempt at temporary aortic valve repair. It’ll still need to go someday, and someday will come soon more likely than not. Given the pulmonary hypertension, the urgency to move forward is now approaching emergency (action stations, action stations…) We got to the hospital last Thursday with lower right ventricle pressure and the expectation of discharge days later. The most senior cardiologists at the hospital are now setting the wheels in motion to get Ari into the operating room for open heart surgery (OHS as we call it in the hood) as soon as logistics allow. We need an MRI first to map out the scar tissue. This will require another anesthesia which takes time for ramp-up and ramp-down. We’ll OR time, surgeon availability, and so on. We are to make no mistake, however. The intent is to get him in there this week. The medical team does believe at this point that the pulmonary hypertension is an effect of the severe aortic stenosis and perhaps the scar tissue in the left ventricle. After the OHS, if the pressure in the right ventricle drops even some, Ewoks will rejoice, and we will begin a process to work that pressure to a lower, less dangerous level. The risk of open heart surgery is, in and of itself, not insignificant. Ari’s chest will be open for the better part of a day, and he will be on heart-lung bypass for up to a few days. This is assuming all goes well. In any case, the train has left the station. Next stop, open heart surgery. Then the story will continue. Know that we are with you every step of the way. Our hearts and prayers are with you all. We pray for God’s complete healing and protection for your precious little one. Our hearts and prayers are with you. We pray for continued strength for you all and for successful OHS for your precious little one, God’s protection and healing. Anne-Todd’s and my prayers are with your family for successful surgery and full recovery. I will say a mi sheberach for Ari for Passover. I too am friends with Jennifer Blanchard Catto and Melissa Riley. Your family and son will be in my continued prayers. You have a lot of love and strength coming your way if I know Jennifers friends. I learned of your son’s little life with its gigantic battles through Jennifer Blanchard Catto. Your family sounds like such an amazing source of strength, Please know that I will be adding you all to my prayers. Keep on fighting little guy…. Lots of love, strength and continued prayers. The Witham family sends prayers to Ari, his parents, and grandparents. What a cutie! Stay strong little guy. Thank you for the updates. Kate and I are praying for you three! Mike, my thoughts and prayers are with you, your sweet Erica and your feisty little baby Ari. I anxiously await your next blog, as I pray for a successful OHS for Ari. Prayers from John William and Mommy. I can only imagine what you’re going through. Praying you get to hold Ari in your strong arms soon. Thanks, Terisa and John William. Ari, Erica and you are now in our thoughts and prayers Mike. We send you all a warm hug from Monterrey, Mexico. Marilu and Alberto. Oh shoot – we were SO hoping that Ari could evade OHS. That said, he certainly has the best fans (& coaches) imaginable. Your candor and humor are so refreshing and rather than seeming cavalier or irreverent lend such a tender hand to the story. That, in the midst of your own scariest battle, you care enough about your friends and family to try to soften the blows of what y’all are dealing with is true selfless compassion. Not to mention it makes for SUCH a better bedtime story for Ari to read HIS children. My thoughts are with you and your family. Sometimes you just wish you could trade places with them and live the hard stuff for them whether it is major surgery or a simple cold. Ari sounds like a tough little guy and I can’t wait to hear his response to your blog someday. Hang in there! Thanks, Felchy. Yeah, he’ll pay me back good when his book comes out, I’m sure. Mike, Erica, Ari, — we love giving Ari his voice. He deserves a voice and so much more. Sending prayers and good thoughts. We are here with you on this journey. Thanks, Greta. Hope to talk soon. Thinking of you three. We know this is not easy to face. We also know all about systemic RV pressures. So we are praying for Ari and you both. You are not alone. Hang in there. Thanks, Jessica. All the best for Ethan, too. Sending you love, prayers and positive thoughts. I love you all so much. Please know that you are in our hearts and prayers every day. God bless. Grace, strength, and courage. Sending prayers. We’ll take all we can get, Mary. Thanks, Steph and Lin. Let’s hope it’s just one more for now. Nice to hear from you, Steph! Much appreciated. Mike and Erica, I am really sorry to hear this news as I imagine it is tearing at your hearts. It is so hard to see your little one have to go through this. You are choosing life for him, why it has to be so hard it unfair. My heart truly goes out to both of you and for Ari, having you by his side is the best healing he could have. We’ll be checking back and hang in there! You are amazing parents!!! Thanks, Brita. We appreciate the support. I can’t even imagine the stress you are going through. My love to you both, and to Ari…..little man, you can do one more. Be strong. God bless all of you.